After the Miracle at Dunkirk, in May 1940, and despite the successful evacuation which was coined as a triumph of British resolution and ingenuity, the prospects were very grim. France had lost its best divisions and was on the verge of defeat. On paper, men were saved and their experience would prove decisive in future engagements, but almost all of the BEF’s (British Expeditionary Force) equipment was left on the French beaches and streets of Dunkirk. In the case of an enemy landing in force, only the Royal Navy and the RAF stood in the path of Hitler. 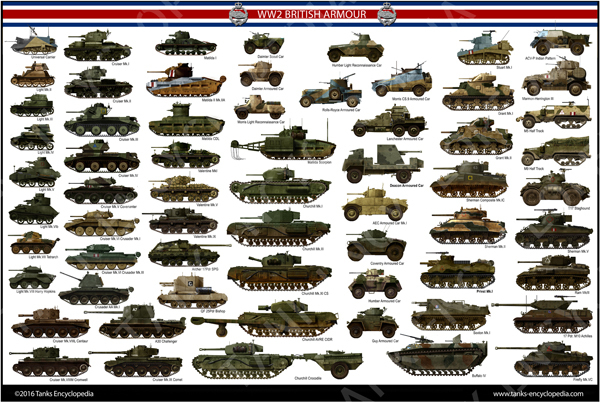 However, the war industry was in full swing, and by June 1940, 21 light tanks, 58 cruiser tanks, 57 infantry tanks, around 3500 Bren guns, 102 25-pdr guns, 188 Bofors AA, and a large supply of shells became available. This was enough to equip only a couple of divisions. Lord Beaverbrook was the Minister of Aircraft Production at that time. He devised a program for the quick and urgent delivery of a large fleet of civilian vehicles. While they were not meant to replace purpose-built military vehicles, they were a quick stop-gap solution until the industry could fill in the requirements. Various types would be built on the basis of the largely available Standard car. 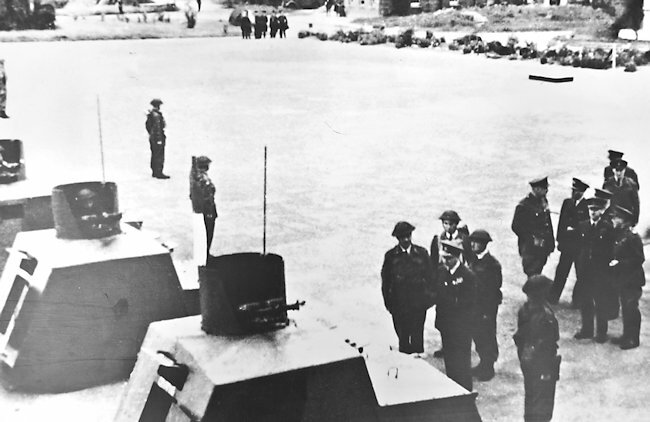 Initial plans called for a fleet as large of 5,000 vehicles to be built in the summer of 1940 for the militias and Army. But with the air war over Britain, and the specter of an invasion fading away, the production was eventually curtailed and then canceled. 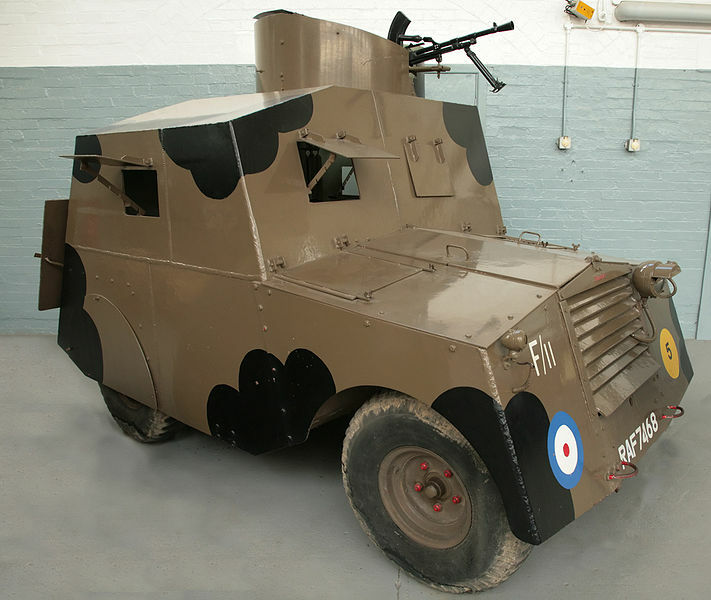 Nevertheless, 2,800 vehicles were converted in the meantime and later given to the British Army and RAF instead. The first Beaverette (Mark I) was really a fast stopgap conversion. The vehicle was given light armored panels on the sides of the engine hood. Three large steel plates, 8-9 mm (0.31-0.35 in) thick were welded to the chassis, covering the front and sides of the driving compartment. There was no roof nor rear protection. The fighting compartment was open to the rear and top, allowing access. Two simple side slits were present on each side. 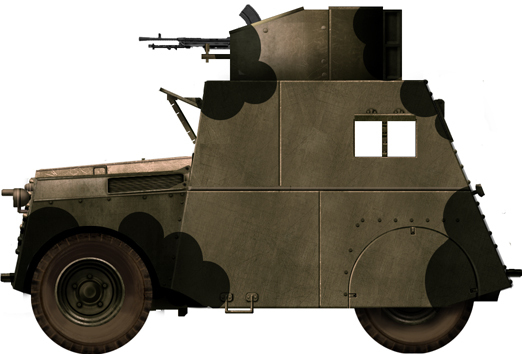 The front plate had a folding armored shutter to the right, for the driver, and a simple slit near the top of the plate for the Bren gun or Boys AT rifle. The Mark II was similar, distinguished by the absence of a rib that went across the middle of the side plate on the Mark I and the change to a horizontal radiator grille. The bulk of the production was made up of the Mark II. There was still space for a third crew member and storage on the bridge over the rear axle. This second series was quite different, based on the short Standard chassis. It was only 10’2” long (3.10 m). But the construction was altered, with five plates covering the front, sides, a split roof, and rear. In addition, the engine hood was entirely covered by new armored panels, and the curved wings eliminated. This additional weight was only partially compensated by the shorter wheelbase. It weighed 2.6 tonnes (2.9 short tons or 2.6 long tons), compared to the 2.2 tonnes of the Mark I/II. 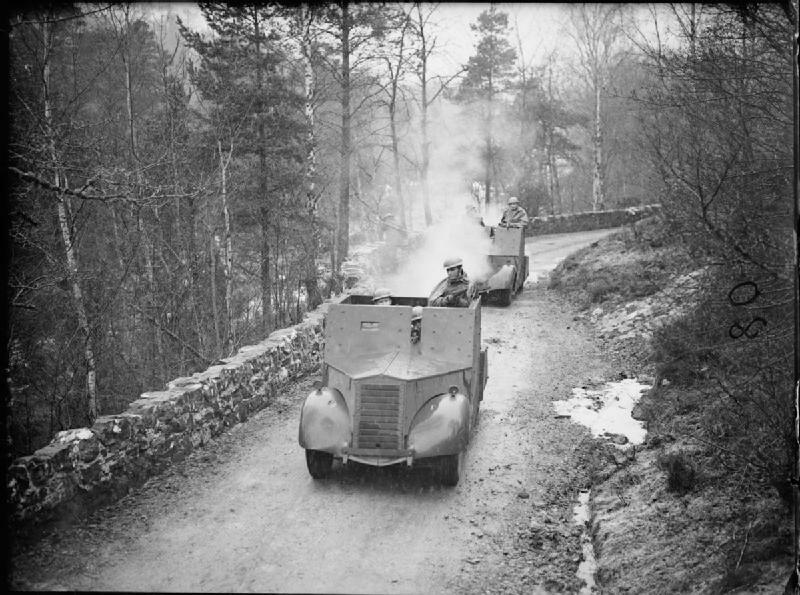 The other major difference was the addition of a third crew member, who took place in a turret located on the left-hand side of the vehicle. 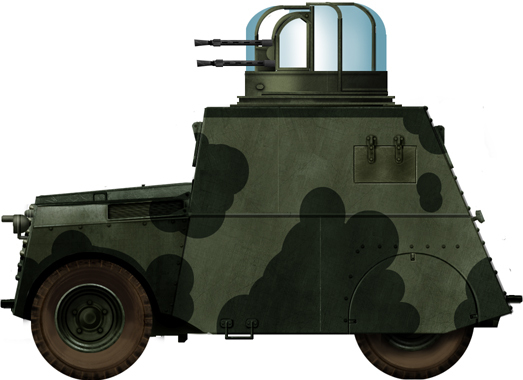 This turret was of several types, the simple open type, with RAF-style ring mount for a Bren, twin Vickers LMGs or enclosed, with a split roof hatch. A single prototype received a Boulton-Paul Defiant steel and glass 0.3 in Browning quad machine guns turret. The Mark III was also nicknamed “Beaverbug” due to its stubby looking. 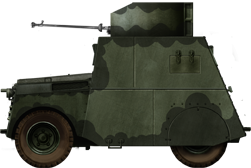 The Mark IV had a redesigned glacis armor to improve visibility and reinforced armor, up to 12 mm (0.47 in) at the front. From the military point of view, the Beaverettes were too heavy for their chassis and suffered from suspension and mechanical fatigue. 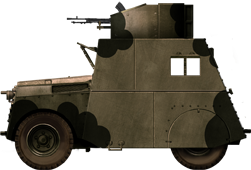 However, they could bear weapons and provide mobility to the Army and were abundantly covered by the press as the “Mosquito cars”. 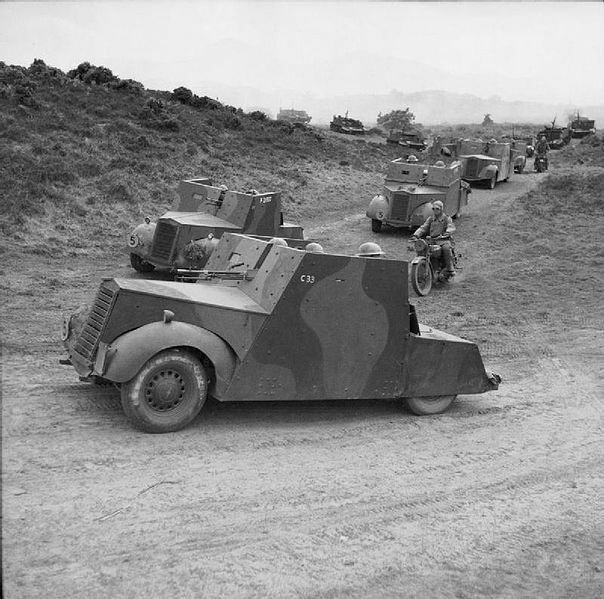 Their true value resided in propaganda, with footage of large fleets of these vehicles training in the countryside, showing British ingenuity and resolve, restoring confidence. By 1941, judged not satisfactory to serve abroad, none left the British isles. They provided the means for patrolling and training the local British Army units and RAF units. 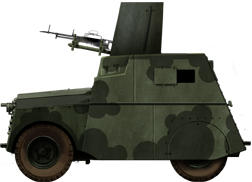 They were also heavily used by the home defense service (mostly Mark III/IVs). New Zealand also built its own improvised series, also called Beaverette (NZ), converted by the New Zealand Railways workshops in Hutt Valley. 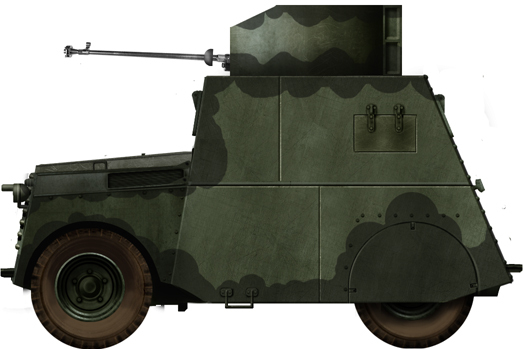 The chassis was a Ford 3/4 or 1-ton truck, whereas the armor plates were salvaged from naval scrapyards (208 built). Despite a valiant 4-cylinder engine, the top speed was an agonizing 38 km/ph on flat and it was quite hard to handle. Beaverette Mark I. Notice the rib going along the side of the vehicle and the vertical radiator grills. 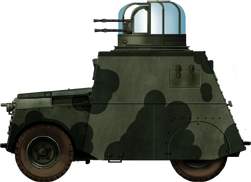 Beaverette Mark II, with the standard camouflage. Notice the lack of the rib from the Mark I and the horizontal radiator grills. Beaverette Mark III, early type armed with a Boys 0.5 in (12.7 in) AT rifle. Beaverette Mark III with Bren gun and “Mickey Mouse” camouflage. 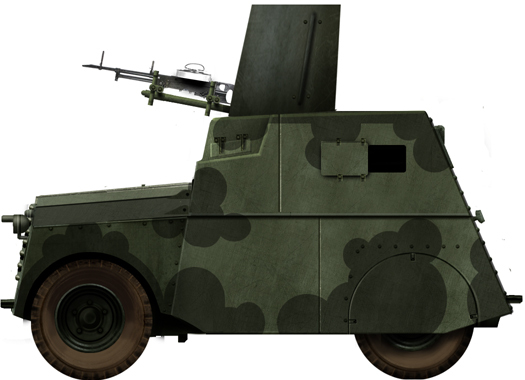 Beaverette Mark IV with a twin Vickers LMGs mount. Notice the redesigned armor. The Beaverette Mark III with the early Boys rifle is incorrectly labeled. 0.5 in ( 12.7 in) should be 0.5 in (12.7mm).